Background and objectives: Cardiovascular (CV) disease causes significant morbidity and mortality among the hemodialysis (HD) population. This meta-analysis was performed to determine whether angiotensin converting enzyme inhibitors (ACEIs) or angiotensin receptor blockers (ARBs) reduce fatal and nonfatal CV events and left ventricular (LV) mass in patients receiving HD. Design, setting, participants, & measurements: Studies were identified by searching electronic databases, bibliographies, and conference proceedings. Two reviewers independently selected randomized controlled trials using ACEIs or ARBs compared with control among patients receiving HD. Studies were independently assessed for inclusion, quality, and data extraction. Random-effects models were used to estimate the pooled relative risk (RR) for CV outcomes and the weighted mean difference (WMD) for pooled change-from-baseline comparisons for LV mass for ACEI or ARB treated patients compared with control. Results: Compared with control, the RR of CV events associated with ACEI or ARB use was 0.66 [95% confidence interval (CI) 0.35 to 1.25; P = 0.20]. ACEI or ARB use resulted in a statistically significant reduction in LV mass, with a WMD of 15.4 g/m2 (95% CI 7.4 to 23.3; P < 0.001). Conclusions: Treatment with an ACEI or ARB reduced LV mass in patients receiving HD. However, their use was not associated with a statistically significant reduction in the risk of fatal and nonfatal CV events. Larger, high-quality trials in the HD population are required to determine if the effects of ACEI or ARB therapy on LV mass translate into decreased CV morbidity and mortality. Cardiovascular (CV) disease is the leading cause of death among patients receiving hemodialysis, with mortality rates 10 to 30 times higher than the general population (1,2). Left ventricular (LV) hypertrophy is common in patients with ESRD (3), is associated with increased CV morbidity, and has been established as an independent risk factor for mortality (3–5). LV hypertrophy in the ESRD population is multifactorial, endorsed by factors including chronic hypertension, volume overload, and upregulation of the renin-angiotensin-aldosterone system (RAAS) (4,6–13). Increasing evidence suggests that augmentation of the RAAS contributes directly to cardiac hypertrophy among patients receiving hemodialysis, independent of blood pressure (BP) effects (12,13). In the nondialysis population, angiotensin converting enzyme inhibitors (ACEIs) and angiotensin receptor blockers (ARBs) lead to reduction in LV mass (14,15), a validated surrogate endpoint for improved survival in the general population (16). In dialysis patients, observational studies have similarly demonstrated that blockade of the RAAS is associated with reduction in LV mass (17,18). However, it is uncertain if reduction in LV mass is a valid surrogate marker for improved outcomes in the dialysis population as it is in the general population. Although the cardioprotective effects of ACEIs and ARBs are well established by randomized controlled trials (RCTs) for the general population (14,19–21), their effects on clinical endpoints in patients with ESRD remain uncertain (22). Additionally, therapeutic agents with proven benefit in the general population may not display similar efficacy in patients undergoing hemodialysis (23). Thus, the effects of ACEI or ARB therapy on LV mass and clinical outcomes in dialysis patients remain unclear. Moreover, it is unknown if interventions that reduce LV mass lead to improved outcomes in the dialysis population. 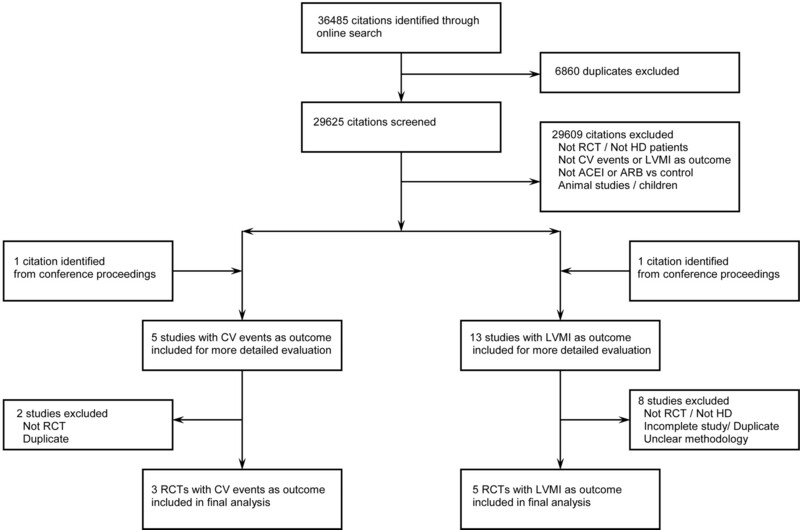 We performed a systematic review and meta-analysis of RCTs to determine the effects of ACEI or ARB therapy on fatal and nonfatal CV outcomes and change in LV mass in adult patients receiving hemodialysis. Two reviewers (D.T. and T.L.) searched MEDLINE (1950 through March 2009), EMBASE (1980 through March 2009), and Cochrane Central Register of Controlled Trials (1991 through March 2009) according to a standardized protocol using the OVID search engine. Three comprehensive search themes were developed and combined using Boolean operators. The first and second search themes were combined with the Boolean operator “or”, and then combined collectively with the third search theme with the Boolean operator “and”. The first search theme, CV events, was created using the Boolean search term “or” to search for the following terms, text words, and database-specific thesaurus terms: “CV diseases” or “CV disease” or “atherosclerosis” or “coronary artery disease” or “ischemic heart disease” or “myocardial infarction” or “acute coronary syndrome” or “unstable angina” or “NSTEMI” or “non-ST elevation” or “STEMI” or “ST elevation” or “heart infarction” or “heart failure” or “congestive heart failure” or “cardiac arrest” or “sudden cardiac death” or “sudden death”. The second search theme, LV hypertrophy, was created by using the Boolean search term “or” to search for the following terms, text words, and database-specific thesaurus terms: “left ventricular hypertrophy” or “left ventricular mass” or “left ventricle” or “hypertrophy, left ventricle” or “hypertrophy, left ventricular” or “heart ventricles” or “LVH” or “LV” or “LV mass” or “LV hypertrophy.” The third theme, hemodialysis, was created by using the Boolean search term “or” to search for the following terms, text words, and database-specific thesaurus terms: “hemodialysis” or “haemodialysis” or “renal dialysis” or “dialysis” or “renal failure” or “kidney failure” or “end stage renal disease” or “ESRD.” A filter was used to limit our search to RCTs (24). Citations identified from electronic databases were supplemented by reviewing reference lists of all identified research and review articles, by reviewing the abstracts of the American Society of Nephrology Annual Meeting from 2003 to 2008, and by contacting experts identified in the review process. The two reviewers independently evaluated articles for eligibility in a two-stage procedure. In the first stage, all identified abstracts were reviewed. Those that met the inclusion criteria or those for which there was uncertainty as to eligibility were selected for full-text review in the second stage. Articles that were selected by either reviewer were evaluated by both reviewers in the second stage and inclusion and exclusion criteria were assessed. Inclusion criteria consisted of (1) study design (RCT), (2) study population (adults receiving long-term hemodialysis), (3) intervention (use of an ACEI or ARB), (4) comparison (with another therapy, placebo, or no active treatment), and (5) outcome (nonfatal and fatal CV events or change in LV mass index). Studies were eligible for inclusion whether published or unpublished and irrespective of language. Studies that included children were excluded. The same reviewers independently extracted data from all studies that fulfilled the inclusion criteria, with disagreements resolved by consensus. Data extraction included study design and baseline demographic information. When reported, data on the following outcomes were extracted: fatal and nonfatal CV events, LV mass index, systolic BP, and LV ejection fraction. Criteria to assess study quality included method of randomization, allocation concealment, blinding, use of placebo, completeness of follow-up, intention-to-treat analysis, and important baseline differences between groups. Assessment of study quality, data extraction, and reporting were in accordance with the QUORUM statement (25). The primary outcome was the composite of fatal and nonfatal CV events. Secondary outcomes were change in LV mass index, change in systolic BP, and change in LV ejection fraction. Random-effects models of DerSimonian and Laird were used to estimate the pooled relative risk for CV outcomes, as well as the weighted mean difference (WMD) for pooled change-from-baseline comparisons for LV mass index, systolic BP, and LV ejection fraction for ACEI or ARB treated patients versus control. WMD is the average of differences between the intervention and control groups from each study; each study's contribution to the average is based on the variance within that study. To assess the effect of duration of treatment, sensitivity analyses were performed for outcomes at 6 and 12 months of follow-up. Because one study had three treatment arms (ACEI, ARB, and calcium channel blocker) (26), the shared control arm was divided into two groups of equal size for independent comparisons with each of the ACEI and ARB groups. The presence of heterogeneity across trials was evaluated using the I2 statistic, which quantifies the percentage of variability that can be attributed to between-study differences. When not directly reported, SD for mean changes was calculated from standard errors. We also tested for publication bias using funnel plots, Begg tests for asymmetry, and an Egger test (24), recognizing the limited power of these tests to detect publication bias given the small number of included studies. Statistical analyses were performed using Stata version 10.0 (Stata, College Station, TX). Progress through stages of the meta-analysis is summarized in Figure 1. A total of 29,625 citations were identified, 29,609 of which were excluded on initial screening. Eighteen studies were selected for more detailed review: 5 reported CV events as the outcome and 13 reported change in LV mass index as the outcome. Following this, ten studies were excluded, leaving eight RCTs that met inclusion criteria for the systematic review: three for which CV events was the primary outcome, and five for which change in LV mass index was the primary outcome. All studies were published in peer-reviewed journals. There was complete agreement for the studies that were selected for meta-analysis and their validity assessment. Table 1summarizes details of the trials that examined CV events as an outcome. Definitions of fatal and nonfatal CV events varied between studies and are reported in Table 2. A total of 837 patients were included from the three RCTs: 419 in the intervention group and 418 in the control group. Treatment duration ranged from 19 to 36 months, with patients randomized to treatment with candesartan (27); fosinopril (28); and losartan, candesartan, or valsartan (29) compared with no treatment (27,29) or placebo (28). The mean age of study patients ranged from 59 to 67 years with a mean duration on dialysis of 33 to 53 months. One trial included only patients with known LV hypertrophy (28), one trial included only hypertensive patients (29), and one trial excluded patients with known cardiac disease (27). Systolic BP <150 mmHg was targeted in one study (29), another targeted a BP <160/90 mmHg (28), and the third study did not indicate a BP target (27). Table 3summarizes details of the trials that examined change in LV mass index as an outcome. A total of 151 patients were included from the five RCTs: 82 in the intervention group and 69 in the control group. Of the 82 patients in the intervention group, 60 were treated with an ACEI (perindopril, enalapril, imidapril, ramipril) and 22 were treated with an ARB (losartan). Of the 69 patients in the control group, 49 were treated with placebo and 20 were treated with a calcium channel blocker (nitrendipine, amlodipine). One RCT included two treatment groups: one treated with an ACEI and one treated with an ARB (26). Treatment duration ranged from 6 to 12 months. Three studies prescribed constant doses of medications (26,30,31), one study titrated medications for diastolic BP ≤95 mmHg (32), and one study targeted a BP of <140/90 mmHg (using protocol additions of benidipine, then doxazosin if needed) (33). The mean age in the intervention group ranged from 45 to 65 years, and in the control group from 48 to 63 years. Two studies included only patients with known LV hypertrophy (32,33). Hypertension was an inclusion criterion in two studies (26,32), one study included only normotensive patients (31), and the remaining two studies did not mention hypertension in inclusion or exclusion criteria. Study quality for trials examining CV events as the outcome is presented in Table 4. Only one trial was blinded to patients and used a placebo as the control (28). Study quality for trials examining change in LV mass index as the outcome was limited, as presented in Table 5. Among these studies, none described the randomization process nor indicated methods to ensure allocation concealment. In the pooled analyses, the relative risk of the composite outcome of CV events associated with ACEI or ARB use compared with control was 0.66 [95% confidence interval (CI) 0.35 to 1.25; P = 0.20] (Figure 2). There was evidence of study heterogeneity (I2 = 85.1%) that could not be further explored given the small number of available studies. 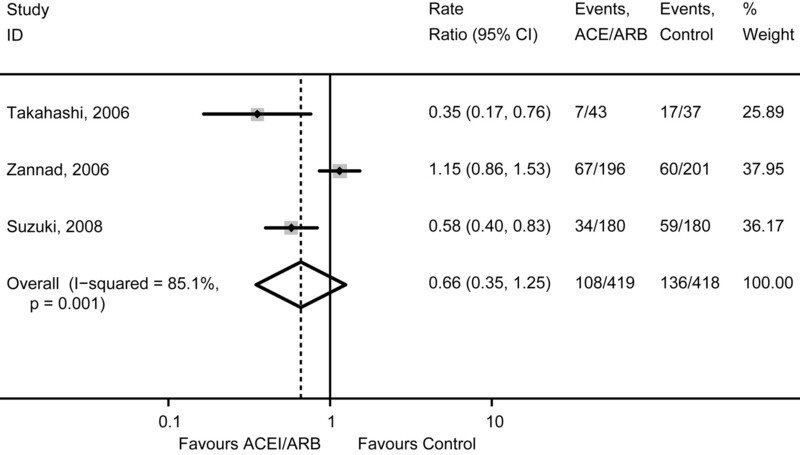 Effect of ACEI or ARB versus control on the risk of CV events. 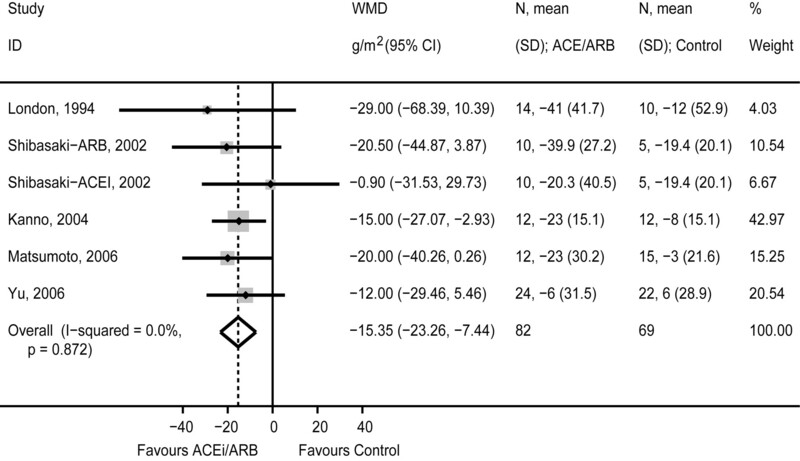 In the pooled analysis, ACEI or ARB use resulted in a greater reduction in change in LV mass index compared with the control arm, with a WMD of 15.4 g/m2 (95% CI 7.4 to 23.3; P < 0.001) (Figure 3). There was no evidence of study heterogeneity (I2 = 0%, P = 0.87). The reduction in change in LV mass index with ACEI or ARB use compared with control was similar at 6 months [WMD 13.0 g/m2 (95% CI 2.5 to 23.5; P = 0.015)] and 12 months [WMD 14.9 g/m2 (95% CI 5.3 to 24.6; P = 0.002)]. The decrease in LV mass appeared to be independent of BP changes because there was no significant difference in the change in systolic BP at study end with a WMD of 4.3 mmHg (95% CI −2.8 to 11.3; P = 0.24). Similarly, differences in the change in systolic BP at 6 and 12 months between the treatment and control groups were not statistically significant (P = 0.55 and P = 0.18, respectively). There was no significant difference in the change in LV ejection fraction between the two groups over the study period with a WMD of 0.06% (95% CI −3.03 to 2.90; P = 0.97). Effect of ACEI or ARB versus control on the change in LV mass index. We found no evidence of publication bias among studies of CV events or LV mass by Egger (P = 0.39 and P = 0.77) and Begg (P = 0.60 and P = 0.57) tests. Analysis of the funnel plots suggested that small, unpublished studies showing lesser benefits of ACEI/ARB for prevention of CV events could exist; however, no such features were suggested from the funnel plots for studies examining LV mass index. In the general population, ACEIs and ARBs have an established role in preventing fatal and nonfatal CV events (14,19–21). However, most RCTs addressing CV endpoints excluded patients with even moderate degrees of kidney disease. Thus, it is uncertain whether ACEIs or ARBS improve clinical and surrogate CV outcomes in the ESRD population. To our knowledge, this is the first meta-analysis to examine the effect of ACEIs or ARBs on CV outcomes and LV mass in hemodialysis patients. A recent meta-analysis assessing BP lowering in ESRD patients demonstrated reduction in CV events (34), although this analysis pooled ACEIs, ARBs, calcium channel blockers, and beta-blockers. In our analysis, we did not find a statistically significant difference in the pooled risk of CV events between treatment and control groups, although this may have been due to inadequate study power despite pooling. The largest study included in our meta-analysis failed to show a beneficial effect of angiotensin converting enzyme inhibition on CV events in hemodialysis patients with LV hypertrophy after 2 years (28). However, this study had important baseline differences between patients in the treatment and control groups: Patients in the treatment group had significantly higher LV mass index and duration of dialysis, and they trended toward higher rates of diabetes, dyslipidemia, coronary artery disease, peripheral arterial disease, and stroke (28). However, our analysis did demonstrate a significant reduction in change in LV mass with ACEI or ARB use compared with control among patients receiving hemodialysis. This difference is potentially important for two reasons: (1) regression of LV hypertrophy has been shown to predict survival of patients receiving hemodialysis in observational studies (35), and (2) regression of LV hypertrophy has been demonstrated in some nondialysis cohorts to be a valid surrogate for improved CV endpoints (16). It is noteworthy that the significant decrease in change in LV mass index with ACEI or ARB use is unlikely to be explained by the small corresponding changes in systolic BP observed over the same time period. This implies that the change in LV mass with ACEIs or ARBs may occur independently of BP control. Furthermore, the extent of improvement in LV mass with ACEI or ARB use in these patients on conventional hemodialysis is similar to that reported with nocturnal hemodialysis (36). Our meta-analysis is limited by the designs of the individual trials identified. The included studies were few in number, consisted of a small number of patients, and were of variable quality. Although three trials with LV mass as the outcome did use a placebo (30,31,33), it was unclear whether or not the studies were blinded to patients and outcome assessors. In general, the trials with CV events as the outcome were of higher quality but there were also notable limitations. The randomization process was not described in one study (28), and this same study had importance baseline differences between study groups. Most studies had small numbers of patients with short duration of treatment, thus limiting generalizability of findings. Finally, only a few studies examining CV outcomes were identified, and these results may be affected by publication bias. Despite these limitations, although there was no statistically significant reduction in the risk of fatal and nonfatal CV events, our meta-analysis suggests that treatment with an ACEI or ARB significantly reduces LV mass among patients undergoing hemodialysis. Given the high prevalence of CV disease in hemodialysis patients, reduced CV mortality of the magnitude noted in this meta-analysis could be highly clinically relevant if confirmed. Further high-quality studies with long-term follow-up are still needed to determine if the effects of ACEI or ARB therapy on LV mass translate into decreased CV morbidity and mortality in this patient population. M.J. is supported by a KRESCENT fellowship (Canadian Institutes for Health Research and Kidney Foundation of Canada) and an Alberta Heritage Foundation for Medical Research Award. M.T. is supported by a Health Scholar Award, and B.H. is supported by a Population Health Investigator Award from the Alberta Heritage Foundation for Medical Research. M.T., B.M., and B.H. are supported by New Investigator Awards from the Canadian Institutes for Health Research. Portions of this study appeared in abstract form at the 2008 Canadian Society of Nephrology Annual Meeting in London, Ontario, Canada (May 28 through June 1, 2008); the 2008 American Society of Nephrology Annual Meeting in Philadelphia, Pennsylvania (November 4 through 9, 2008); the 2009 Canadian Society of Nephrology Annual Meeting in Edmonton, Alberta, Canada (May 10 through 13, 2009); and the 2009 American Society of Nephrology Annual Meeting in San Diego, California (October 27 through November 1, 2009).